Command the gripper to open and close! With Robotic Arm Edge, command the gripper to open and close! 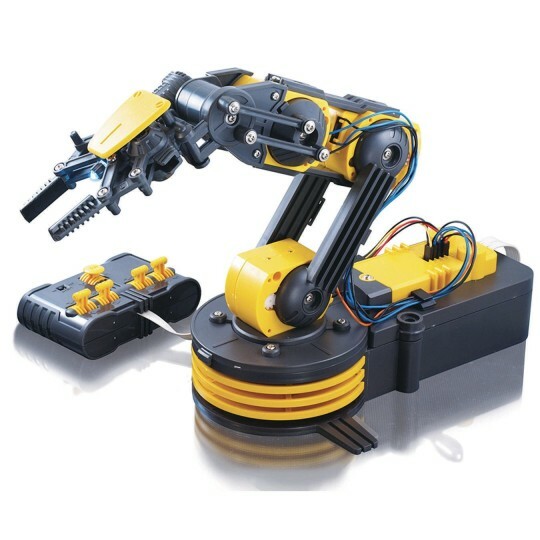 Features a wrist motion of 120 degrees, an extensive elbow range of 300 degrees, a base rotation of 270 degrees, base motion of 180 degrees, vertical reach of 15", horizontal reach of 12.6" and lifting capacity of 100g. WOW! Some of the added features include a search light design on the gripper and a safety gear audible indicator is included on all five gear boxes to prevent any potential injury or gear breakage during operation. Total command and visual manipulation using the 5s: five switch wired controller, five motors and five joints. Selected as "Best Picks" by Dr. Toy and Top Ten Toys by Rhode Island Monthly.